Michael B. Briggs DVM, MS - Dr. Briggs is a long-time zoo, aquaria, and wildlife veterinarian who graduated from Washington State University with his DVM and also with an MS. Since then, he has devoted his career to work with both captive and free-ranging species. He has worked as a staff veterinarian with Wildlife Safari in Winston, Oregon, as well as associate veterinarian at Chicago Zoological Society for many years. Since 2004 he left the classic zoo world and expanded his burgeoning international consulting business and started Global Veterinary Consultancy. He also, with his wife Beth, started an NGO to do research on free ranging African carnivore called the African Predator Conservation Research Organization and held the position of CEO and Principal Investigator. He has consulted previously or is still consulting in China, Singapore, the Philippine Islands, Portugal, Mexico, USA, Myanmar, Taiwan, Japan, and South Korea. He has extensive experience in a variety of marine mammals, birds and elasmobranchs. He has dedicated his entire professional life to the survival of threatened and endangered species, on the big scale, and the individual clinical care from the consulting and zoo medicine side. He has been an IAAAM member since 1992 and been to all but 2 IAAAM annual conferences. He is true believer in the goals of the organization and excited about the possibility of continuing them forward. Eric T. Anderson DVM, DACZM - Dr. Anderson is the Director of Animal Health with OdySea Aquarium in Scottsdale, Arizona. He received his Doctorate in Veterinary Medicine from the University of Florida, and following two internships, completed a residency in Zoo and Aquatic Animal Medicine at North Carolina State University. He became board certified in Zoological Medicine in 2012. As the Director of Animal Health, he is responsible for the preventative health care program and clinical case management for all animals housed by OdySea Aquarium and Butterfly Wonderland. He has been involved with animal education, care and health for over 20 years, including wildlife rescue, rehabilitation, research, and conservation efforts across the United States and the Bahamas. Cara Field, DVM PhD, DACZM - Dr. Cara Field has been the Staff Veterinarian at The Marine Mammal Center in Sausalito, California since 2014. Her primary roles include the care of approximately 800+ stranded marine mammal patients annually, conducting and assisting with numerous research projects, and teaching the veterinary intern as well as dozens of veterinary residents, international vets, students, and other visitors who come to TMMC each year to learn about marine mammal medicine and health. Dr. Field completed the dual DVM/Ph.D degree program at the University of California Davis in 2005, where she studied the effects of high pressure on blood platelets from elephant seals. In 2006 she began working at Mystic Aquarium in Connecticut for three years as a post-doctoral researcher studying marine mammal brucellosis, and was subsequently the intern veterinarian there. She then worked in New Orleans as Associate Veterinarian at the Audubon Nature Institute, serving as the primary vet for the Audubon Aquarium and Stranding Program which was heavily involved in oiled aquatic animal response due to the BP Deepwater Horizon oil spill in 2010. She also worked in depth with the zoological caseload at Audubon Zoo and the Audubon Center for Reproduction of Endangered Species. Dr. Field then accepted a position as Associate Veterinarian at the Georgia Aquarium in Atlanta, one of the largest aquariums in the world, for several years before moving back to California to work at TMMC. She became a Diplomate of the College of Zoological Medicine with specialty in Aquatic Animals in 2018. Julie M. Cavin, DVM - Julie M Cavin is the Senior Veterinarian at Gulf World Marine Park (GWMP) in Panama City Beach, Florida which is part of the Dolphin Discovery group which includes over 20 marine parks in 3 continents. She oversees the care of the diverse GWMP collection along with bottlenose dolphins at Dolphin Connection in Duck Key, FL, another Dolphin Discovery park. She is also the senior vet for Gulf World Marine Institute which rehabilitates sea turtles and cetaceans and is the back-up consulting veterinarian for Living Exhibits. Prior to her current position, Julie received her veterinary degree from North Carolina State University and completed a two-year internship at the Georgia Aquarium. She was then a veterinarian at the New England Aquarium for nearly eight years and South Carolina aquarium for almost one year. During her career, she has authored or co-authored numerous publications and lectured at Cummings Vet School at Tufts University, Aquavet, and Marvet as well as national and international conferences. She has been an active member of IAAAM since 2007, presented several times, and assisted with reviewing abstracts and student presentations. IAAAM is now accepting dues payments for 2019 Membership. If you were a member of IAAAM in 2017 or 2018, you can renew your membership on our 2019 Membership Dues Page. Filling out a new member form at https://iaaam.org/iaaam-membership-form. For full membership, you are also required to submit a current CV or Resume to membership@iaaam.org and have a current full IAAAM member serve as your sponsor. They can send word to our membership chair at membership@iaaam.org. For student membership, you will need to provide proof of student status by having a school official, internship director, or appropriate individual send a message to our membership chair at membership@iaaam.org. Click here for more information about the Medway Scholarship. Click here for a copy of the Medway Scholarship Application. Tenerife, 22 September 2018. Loro Parque has good news to share: the orca Morgan that was rescued after being found near dead near the coast of the Wadden Sea in the Netherlands and that forms part of our group of orcas, gave birth to her first calf this morning, which finds itself in a perfect state of health. From the very first moment, Morgan demonstrated to be an exemplary mother attending to her newborn, which is swimming next to its mother in the installations of the ‘OrcaOcean’. The orca Morgan was rescued at the coast of the Wadden Sea in 2010 and was attended by a team of experts of the Harderwijk Dolphinarium in an effort to help the lost animal, which showed such a severe malnutrition that the animal was only skin and bones. In this moment, Morgan only weighed 430 Kg and the keepers of the Dutch dolphinarium were not sure that the animal was going to survive the first night after its rescue. They, however, were hopeful that with a proper level of care, affection and attention of the care givers, as well as with the adequate nutrition, the animal could make a recovery. Thanks to all these efforts of the team at Harderwijk, the animal began to recover its weight and strength, and as the Harderwijk installations were not prepared to keep orcas, the Dutch authorities initiated a formal commission to determine the future of the orca Morgan. A group of international and independent experts came to the conclusion that there were only two viable alternatives for the animal: euthanasia or to be kept at an installation of an aquarium that complied with the necessary conditions for this animal species. At this moment, as Loro Parque had the most modern installations for orcas in existence, the Park was contacted to see if it would accept the animal. Despite all the challenges that this request represented, Loro Parque accepted the petition, thus, avoiding the only other alternative that was left for the animal: the euthanasia. After a few months at our installations, the orca Morgan adapted to the new conditions and integrated perfectly into the existing group of orcas at Loro Parque. At the same time, it was discovered that the orca suffered a severe hearing deficiency, which was yet another argument to confirm that animal was incapable to survive on her own in nature. Given this last circumstance, there were a number of questions as to what exactly a delivery would imply for the animal without a hearing capacity. Today, Loro Parque would like to share the great news: the delivery went in a completely normal manner and the first hours after the birth have been developing in accordance with the best expectations. It is impossible to know the gender of the new calf yet, although the most important issue now is that both, the mother and the calf, find themselves in a perfect state of health. Loro Parque will be informing the public about the development of the situation, and would like to take this opportunity to thank all its visitors from many different parts of the world, the tour operators and all the collaborators in the scientific field for all the support to the Loro Parque mission: to protect and conserve animals and their natural habitats for future generations. The AVMA Clinical Practitioners Advisory Committee (CPAC) makes recommendations to the Council on Biologic and Therapeutic Agents (COBTA) which takes the recommendations to the AVMA for consideration or action. I am on the CPAC representing zoos, aquariums, and wildlife, so I'd like you to contact me if you have any issues you think the AVMA should be reviewing. Examples would be the availability of necessary medications or regulations that make doing your job difficult (if you think the AVMA could do something about it). The minutes of the Business Meeting from the 2018 IAAAM Conference is now available. Click here to view the minutes. In 2018, the IAAAM Board voted to create a Lifetime Achievement Award for Aquatic Animal Medicine and to name this award for the inaugral receipient, Sam Ridgway. IAAAM want to acknowledge Dr. Ridgway's hard work and dedication which was instrumental in developing the field of aquatic animal medicine. Aquatic Mammals Journal video of Dr. Ridgway discussing the history of his work with marine mammals. With personal privacy in the news worldwide, the IAAAM has changed and posted it's privacy policies at http://www.iaaam.org/privacy/. We have also given you more options to control the personal information IAAAM collects and stores about you. If you have any questions, please feel free to read the privacy policies and contact webmaster@iaaam.org. Puerto de la Cruz, April 17th, 2018. 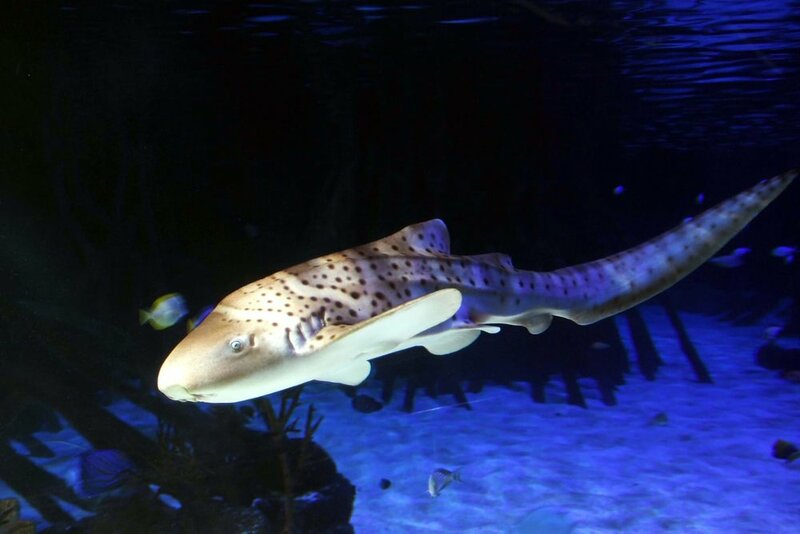 Udra is the name of the female zebra shark that became the first specimen of this species born in an aquarium in Spain. The team of the Loro Parque’s aquarium, whose efforts have enabled this breeding success, is very proud to confirm that the animal has completed the required quarantine period, during which it was receiving all the necessary care and attention. Now it is enjoying its new, spacious home in the mangrove of Aqua Viva. It also means that the guests of the park have a unique opportunity of seeing it, for the first time, in this exhibition of the park, which was recognized by Trip Advisor in 2017 as the best zoo in the world. Since its birth, Udra has been participating in unique shark training program developed by the experts of the Loro Parque’s aquarium. Thanks to this training, such important procedure as voluntarily blood extraction was made possible. Moreover, through this training, it has become accustomed to regular voluntary veterinary check-ups, which not only allow the aquarium team to ensure its maximum well-being but also provide researchers and scientists with valuable information about this species. From now on, the visitors of the park will be able to observe the training sessions with Udra. Udra is an offspring of two other zebra sharks of the park, Marylin and Elvis, who, since then, have had more young ones. Nevertheless, Udra has a special meaning for the aquarium’s team, because it was the first specimen of this species to be born under their care, converting the aquarium into the first among the aquariums of Spain to have bred this species. The young shark has been progressing steadily since her birth in October 2016. Weighing originally only 0.072 kg, it is now at 0.390 kg, and it has grown from the original 27.3 cm to 118 cm. What is curious about these animals is that they received their common name, zebra shark, due to their appearance at birth. While they are young, they display while stripes over darker bodies, hence the name. The appearance changes as they grow, and by the time they become adults, the stripes will have evolved into black spots. These sharks are slow but elusive swimmers; they do not chase their prey, but rather corner it using their large flexible body to prevent it from escaping. Breeding and reproduction work carried out at Loro Parque is essential to provide scientists with the vital and much-needed information about the conservation of not only of this particular species but also of other, much more threatened species. Thus, Loro Parque Foundation, with the support of its primary sponsor, Loro Parque, among many others, has been successfully conducting marine wildlife conservation and protection projects. Among them, are the projects with such species as the angelfish (Squatima squatima), considered to be the most endangered shark in the world, and the hammerhead shark (Sphyrna sp. ), a species that finds itself under a lot of pressure primarily due to aggressive fishing techniques and other adverse conditions.